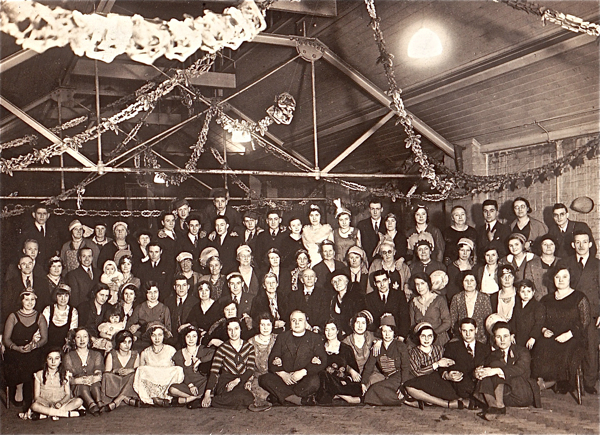 This is the first photo of the remarkable Mavis Bullwinkle, seen here attending a Christmas party in 1932 at the Drill Hall in Buxton St, hosted by Rev Holdstock of All Saints’ Church, Spitalfields – Mavis can easily be distinguished to the left of the happy crowd, because she is a baby in her mother Gwendoline’s arms. 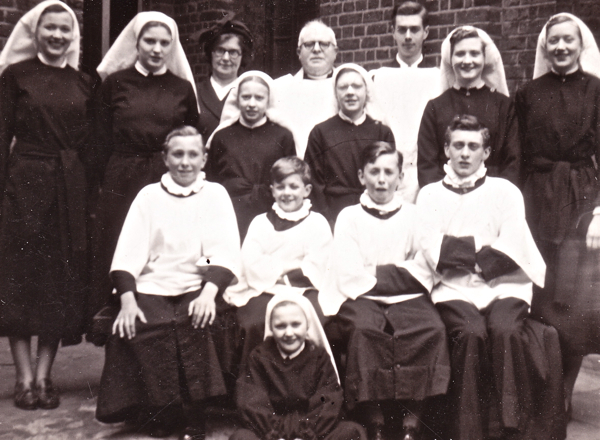 In this picture, you see her at the centre of life in Spitalfields and even though this hall does not exist anymore and the church it was attached to was demolished in 1951, and everyone else in this photo has gone now too, I am happy to report that Mavis is still alive and kicking, to carry the story of this world and continue her existence at the centre of things in the neighbourhood. 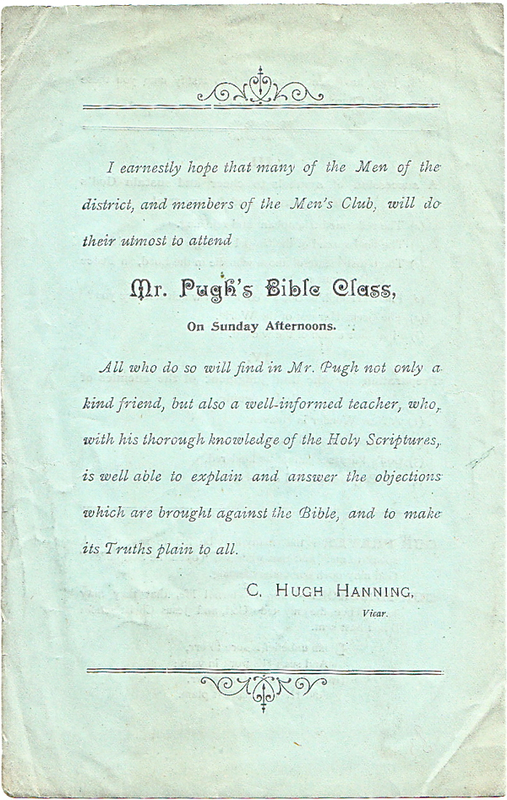 Mavis’ grandfather, Richard Pugh, was a lay preacher who came to Spitalfields with his wife and family from North Wales in 1898, where he held bible classes at All Saints and spoke at open air meetings and, in the absence of social workers, counselled men from the Truman Brewery in their family problems. His mother paid for him to return alone to Wales to see her for two weeks annual holiday from the East End each year. But Mavis’ grandmother Frances never had a holiday, she said, “Why should people take notice of you when you talk of living the Christian life, when you have an easier time than they do?” Then in 1905, Richard died unexpectedly of pneumonia and Frances was left almost bereft in Spitalfields. She had to leave the church house and take care of her seven children alone. She received a modest pension from the Scripture Readers’ Union until her youngest son, Albert, was fourteen, the Truman Brewery gave her a small grant twice a year and she took work scrubbing floors. Mavis’ story of her family’s existence in Albert Family Dwellings spans the original flat where her grandmother lived with her two maiden aunts, and then Mavis’ parents’ flat that she grew up in. Mavis took care of her mother and the two aunts, who lived to be eighty-six,ninety and ninety-five respectively, even after they all moved out – seventy years after they first moved in as an act of expediency. But by then the nature of the place had changed and it was condemned as part of a slum clearance programme. “It suddenly went down hill in the late fifties when the housing association sold it,” admitted Mavis with a regreftul smile, looking from her living room window across the rooftops of Spitalfields to the space where Albert Family Dwellings formerly stood, a space that holds so much of her family history. 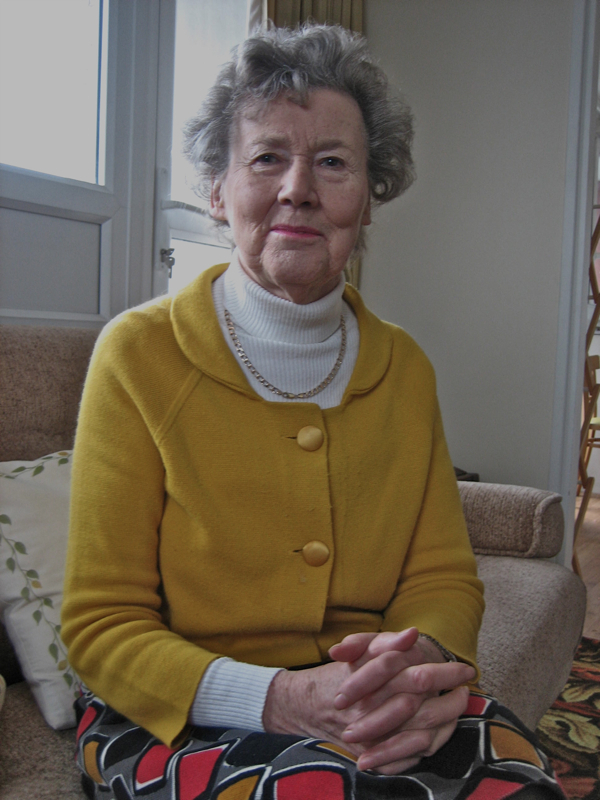 If Mavis had married, she would have left Spitalfields but instead she stayed to care for the elderly members of her family and worked for forty years as a secretary in the social work department at the Royal London Hospital, where she was born in 1932. A woman of dauntless temperament, even retired now, she returns one day a week on a voluntary basis to do typing for the friends of the hospital and on another day each week she does reading with a reception class at Christ Church School in Brick Lane where she is a governor. Mavis Gwendoline Bullwinkle – Citizen of Spitalfields – is a woman who makes no apology to call herself a secretary, because she is inspired by the best of that proud nineteenth century spirit which carried a compassionate egalitarian sense of moral purpose. 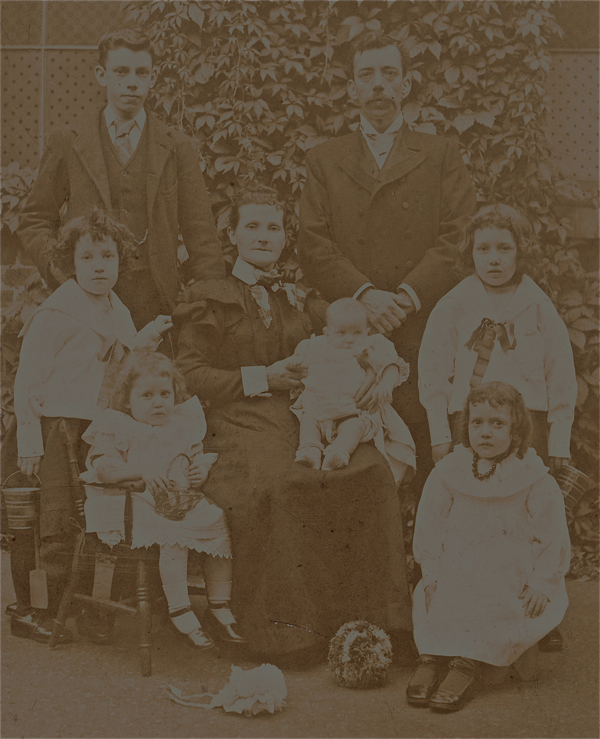 Mavis’ mother’s family, the Pughs of North Wales, photographed in Spitalfields in 1900. At the centre, Mavis’ grandmother Frances holds Mavis’ mother Gwendoline as a baby, with her grandfather Richard at her shoulder, a lay preacher who died unexpectedly of pneumonia four years later. 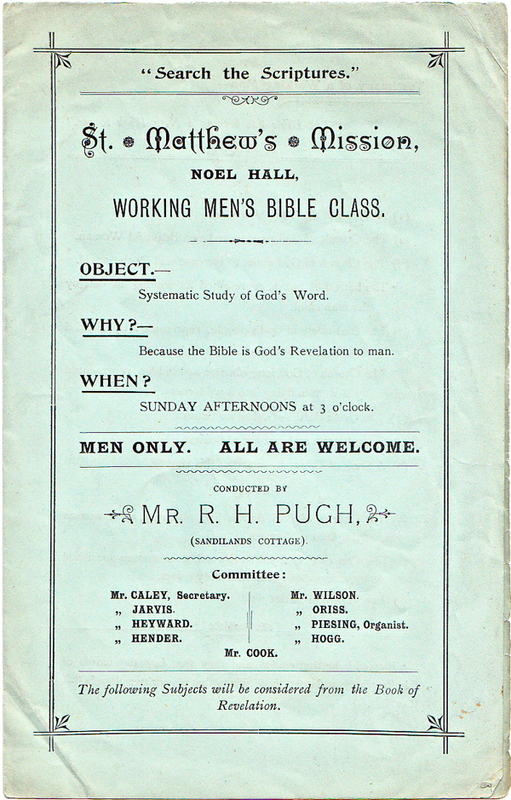 Handbill for one of Mavis’ grandfather’s bible classes at St Matthew’s Mission, Fulham. Mavis’ mother Gwendoline and her sisters at All Saints School, Buxton St, Spitalfields, 1904. g – Gwendoline, l – Laura, a – Ada and h – Hilda. 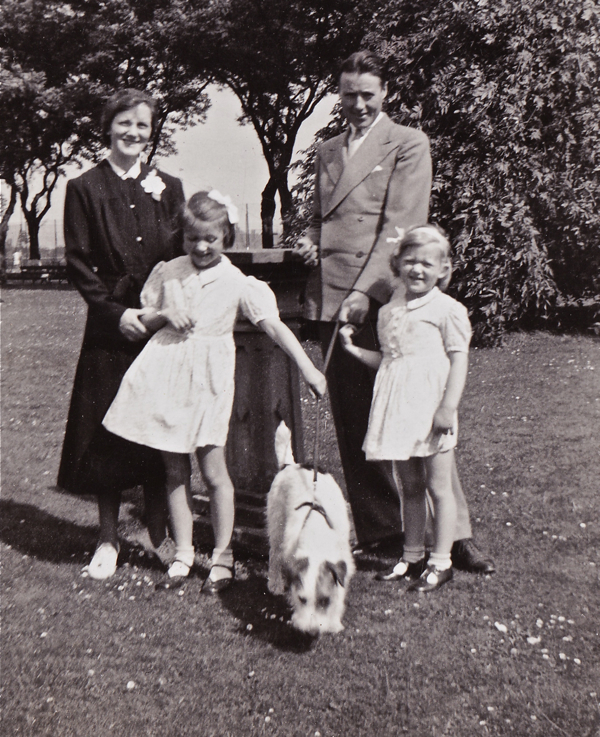 Mavis, with her parents Gwendoline and Alfred, and younger sister Margaret in Barking Park, 1939 – before Mavis & Margaret were evacuated to Aylesbury. Mavis stands on the extreme left of this picture of the All Saints Church Spitalfields choir, 1951. 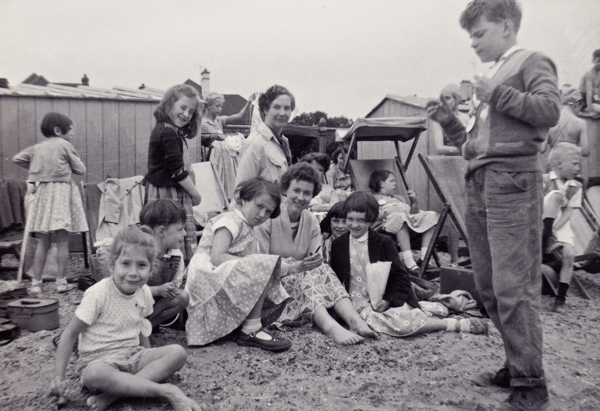 Mavis sits at the centre of the picnic at this Christ Church, Spitalfields, Sunday School outing to Chalkwell in the late fifties – presided over by Mrs Berdoe (top centre). Mavis Bullwinkle in her Hanbury St flat today. My, what an intelligent face. Alive and kicking indeed, and the keeper of so many stories. Thank you for another gem. Indeed, a marvellous piece – and coincidentally I am probably a distant relation, my mother also being a Pugh. If Mavis is interested, I’d be happy to see if there’s a link somewhere in the chain! Mavis has the loveliest face, doesn’t she? yes, she does, and what poise! We are Mavis’s great nieces and found this very funny and interesting! We have sent this to the rest of the village where we live as Mavis is also very well known here as she is a regular visitor to Alderton, Northamptonshire. She helps out at community events like our annual Arts Festival. Our mum is Mavis’s niece, daughter of Margaret. What interesting reading. I am an Alderton resident and we count Mavis as ‘one of us.’ She comes to visit her niece and family regularly and joins in with everything in the village. You were very fortunate to meet her and hear her stories first hand. So many of these memories are lost forever. She is a lovely lady. I concurr with Doris and Graham and Jackie. We all love Auntie Mavis in Alderton and are always very pleased when she spends time in the village. She always has her handbag with her, no matter what she is doing. She sometimes helps me on my white elephant stall at our annual arts festival – she’s a great saleswoman and always has that bag with her. I don’t think I have ever seen Mavis without a smile. She may be a senior lady but is always young at heart – always interested in what everyone else is doing and how they are. She is always welcome in Alderton. My maiden name was Bullwinkle my father born in Bow Alfred William Bullwinkle (deceased) August 1919 His father was Charles William Bullwinkle. I remember the name Teddy Bullwinkle being mentioned. Are we related? I met Mavis tonight at the event in Fournier Street and it was when we go chatting we realised that we had known each other when we both worked at The London Hospital in 1982! I remember her so clearly. She has not changed one bit, still happy and full of energy, her voice has not changed at all. Still the same chic clothes as well. I have never forgotten her because she was so cheerful. It was so wonderful to meet her again. I came across this article researching Family History for Richard Henry Pugh my great great grandfather. I have not seen ‘Auntie Mavis’ for a long time. I do however have photos and documentation on Richard H Pugh. These came from my mother Laura May Pugh whose father was Albert Edward Pugh, brother of Gwendoline Pugh. I have very vivid memories of the Albert Family Buildings in Deal St which I often visited as a child with my Mother and Father. This was to visit my Mothers close relatives Hilda and Ada Pugh. My mother took great interest in the history that surrounded her upbringing and documented quite alot, from living in Brushfield St opp. Spitalfields Church to her father being church warden, living in the Church Hall at Buxton St and during the war sleeping in the crypt under the Church, being evacuated to Aylesbury, I have great memories of all these stories. Long live Spitalfields! I have known Mavis since 1994. She is a lovely Christian lady. She has taught me many things concerning the Bible. She is a woman after my own heart and tells it like it is! The world is a better place for her being in it. I grew up in Howard Buildings this was the block opposite Albert i was born at 16 Howard buildings in 1953 and lived there until 1975 as well i remember Miss Bullwinkle . i had a lot of family living there we were the Magraws, pritchards , pearce, and Vanners i dont know if she remembers my mum Nellie Magraw. Have great memories of growing up in the buildings there was loads of kids and we had a great time playing in the playgrounds of the buildings. Does she remember the Bennet sister two old spinsters who all th kids were frightned of? Heartwarming! Makes life today seem full of self-interest and indulgence. Although their lives were hard, they had each other and so much more. I looked at the photo of the Rev. Holdstock and i think i saw my mother in the photo also my father could have been in the photo as well. My mothers name at the time was Minnie Matilda Hilton my father was William Diderick Tyrrell.I knew the Rev Holdstock when i was a child i went with my father when All Saints was no more in 1951. The candles,plates and cross are now at St Pauls Church Arrowsmith Road Hainault Essex as they were given to my father at the time for St Pauls Church they were still there as far as i know.In 1945 until 1947 we lived in 15 Howard Buildings Deal Street.From 1947/48 we moved to hainault but my father kept in touch with Rev Holdstock as my Grand parents on my fathers side lived in Howard Buildings.I think it was No 1. I was looking for any pictures of churches that my Ancesters were associated with for my family tree when I came across this page, & read the comments , & I just had to add mine My family lived in Albert & Howard Buildings since the end of the the late eighteen hundreds until 1971 when my Grandmother died. Mavis might remember our family, I certainly remember her lovely family, Our family name was Smith & we lived in No. 39 Albert Bldgs until 1950 above us lived the Yates family & above them lived Mavis’s family if my memory serves me correct. I was Baptize’d by the Rev. 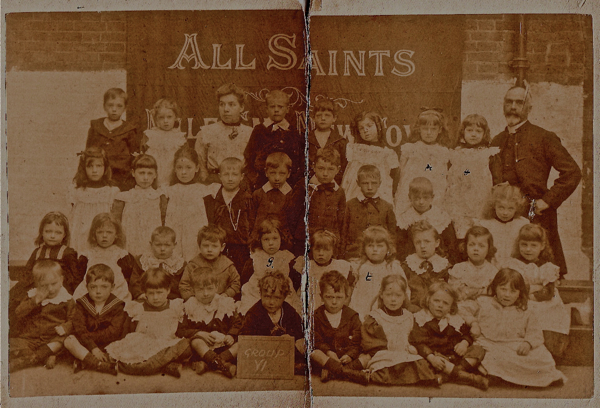 Holdstock In All Saints Church 11-02-1940 & attended the School until I was 10. I do remember they used to have tea afternoons at the church house in Buxton St. during the War years, & the children were allowed to play in the lovely back garden. most of the names that have been mentioned in other comments I can recall. 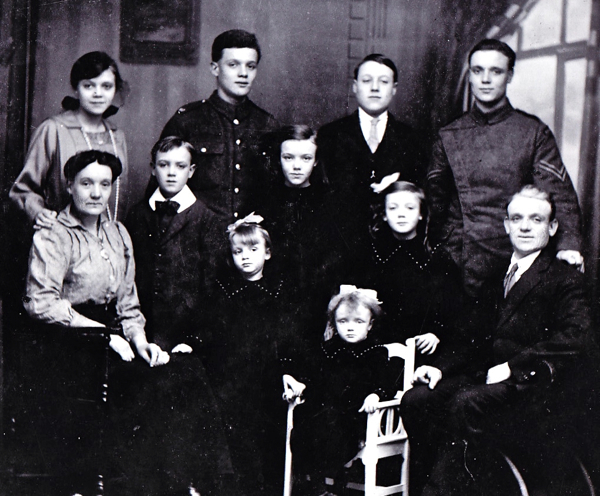 If any one remembers the Smith family.My parents names were Alfred & Lily, us children. Shirley Betty Jean & John in that order, apart from my parents we are all still alive, I live in New Zealand now & my siblings in the U.S.A. If any one should have a picture of the Church would love for it be shown.